Filters are the necessary evil of aquariums. While hobbyists and aquarium enthusiasts can talk in depth about which type of filter is best, some have already decided they’re set on a canister filter. So, which canister filter is best for your tank? Well, everything you need to find out is right here! Like most aspects of building your aquarium, not all filters are made equal. We’ve found the best canister filters on the market that cover a wide range of budgets and needs. See which one is best for you, but first read through this evaluation on what makes a high-value filter! 1. Is your tank salt or fresh water? 2. How large is your tank? 3. Why are type of habitat you building? 5. How does a canister filter work? 6. What is the purpose of having a Canister filter instead of another type of aquarium filter? 7. How to set up a canister filter? The specifics of each and highlights are all reviewed here! This is a complete kit that is a good place for beginners to start. It tops out at 265 gph and is known to be reliable. This filter is an option that works well with nearly any type of habitat including turtle and reef habitats. One of the best features here is the versatility for the price. 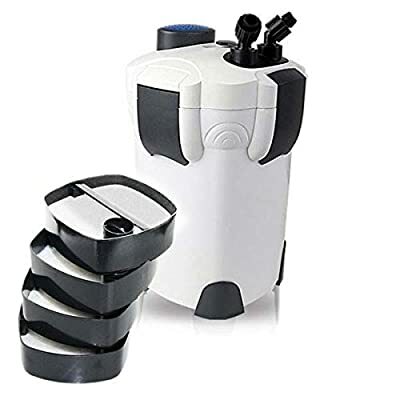 It is a complete filtration kit for less than fifty dollars that doesn’t restrict your flexibility in terms of the number of compartments available. If you’re new to aquariums or canister filters this might be one of your top choices. We don’t like that this is best suited for 35-75 gallons but they recommend its use for up to 100 gallons. This filter wouldn’t be well suited on a 100-gallon tank. If you have a large tank, you would probably look for another filter. The complete kit at this price is really what makes this filter stand apart from the others. Canister filters can quickly become expensive because of the power they have. This one is affordable and has everything you need to get acquainted with canister filters. The Eheim brand is well-known for producing reliable canister filters. The size capacity of the filter is great for most home aquarium enthusiasts who have between a 75-90 gallon tank (many of the most common sizes). Extra points for being very quiet when running. 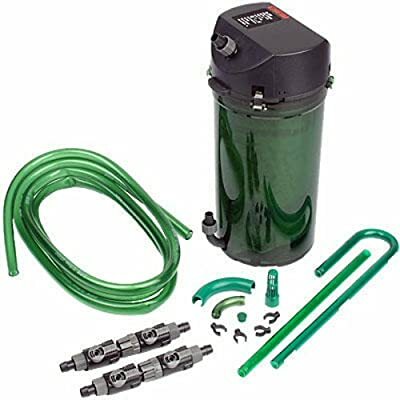 Overall this is a great price for a canister filter that has this power. But, if you’re just starting out in building your aquarium it is a little pricey. If you’re dedicated to having a high-powered canister filter we wouldn’t eliminate this one on price though. Its quiet nature without loss of power is what sets this apart. This is a great option for people who don’t have an enclosed space for their filter. It doesn’t look bad and it doesn’t make a lot of noise so it can sit on a shelf or underneath your tank without disturbing you or guests. The Hydor external canister filter has a ton of options that haven’t appeared on this list so far. It also has a number of tiered options in terms of size. You can purchase this model in a range from anywhere of 20 gallons to 150 gallons (of course price varies). The setup for this filter is really easy and it comes with clear instructions. On top of it, the manufacturer answers questions on many platforms so you can contact someone if you’re really having trouble. This is a benefit that aquarium enthusiasts often look for in companies, someone who loves their tank as much as they do! We didn’t like the scaling options. Although the 60-100 gallon filter that is being reviewed here is well spoken of, other sizes don’t have the same feedback. It seems like the bigger you go in the size you begin to lose power. The size of this filter for its gallon capacity is pretty impressive. It handles up to a 100-gallon tank comfortably, mostly quietly and it’s still less than a foot wide or long. This is one of the larger canister filters on this list and brings a lot of value to it. Everything you might be looking for in a top-tier canister filter. Polar Aurora packed this filter with other features like side handles for easy handling and adding two more media trays for extra filtration. The extra trays for media filtration give you room to experiment with different filter media options without compromising quality. On top of it, the UV sterilizer is one of the most commonly requested features for aquarium filters. Unlike the other Polar Aurora on this list, the power is lacking in this one. Probably because of all the great features they’ve added on. But, overall there are a number of reports that this is only great as a supplemental filter. The features for sure make this filter standout. The UV sterilizer and added media compartments are sought after features. Fluval is a well-known name in filters and their canister filter system is no different! This model has a number of scaled options ranging from filters that can handle 25 gallons up to 100 gallons. There is one feature that is wonderful for setup and cleaning, the single-motion lift clamps. Assembly is pretty easy, cleaning is pretty easy and the valves have an easy open function that is only on Fluval models. The Fluval 06 Series really doesn’t have anything to dislike. 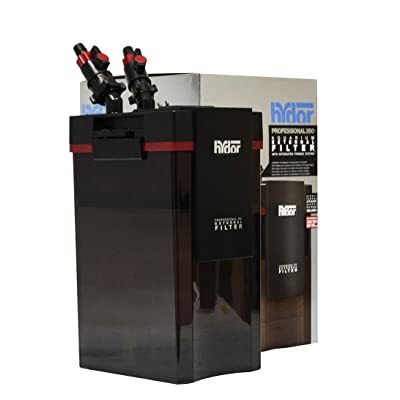 It may be out of some budgets but overall this filter is reported to work in peak condition for a long time so the investment is worth it for some aquarium owners. The power in combination with the ease of use makes this filter noteworthy. The ability to easily clean a canister filter can be a make or break for many aquarium owners that enjoy their tanks but don’t have hours to spend cleaning the tank. Penn Plax is one of the most popular aquarium product production company in the world. They have a good reputation, and their filters are of great quality. They produce canister filters for saltwater and marine tanks ranging from 30 gallons to 200 gallons. 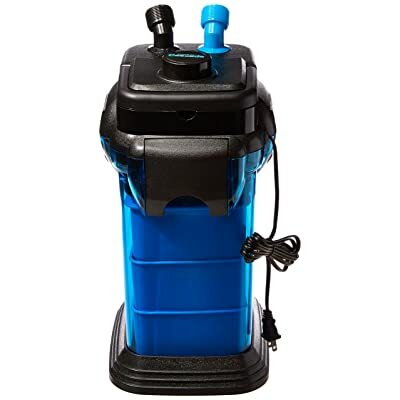 The Penn Plax Cascade 1000 Canister Aquarium Filter is designed for tanks that are up to 100 gallons, and it pumps at a rate of 265 GPH (gallons per hour). It comes with two trays, each of them has a foam, one is equipped with charcoal, and the other is equipped with filter media. It is also equipped with a spray bar. If you are looking for a canister filter with easy setup, then this is a great option, as this filter is easy and quick to set up. It also features a three-stage filtration process (mechanical, chemical, and biological) which keeps your water crystal clear and free from harmful toxins. The flow valves of this canister filter rotate 360 degrees, making it much easier to maneuver in even a very tight aquarium cabinet. The priming is also easy, as it comes with a push button that lets you easily and quickly prime the filter with only a couple of presses. It has a water injection button that makes priming easy. Easy and fast hose detaching for maintenance. 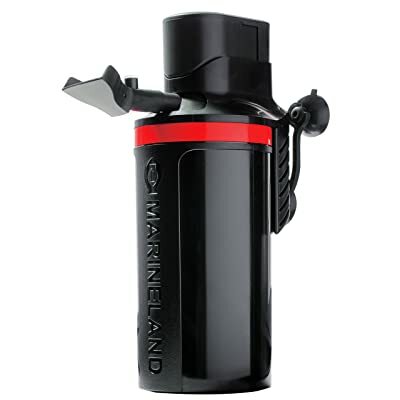 This MarineLand Canister Filter boasts of new and improved features that make it unique. These features are aimed at making the product consumer friendly and mess-free. One common issue with filters is their lids –which comes off easily, making its content to spill all over the place. 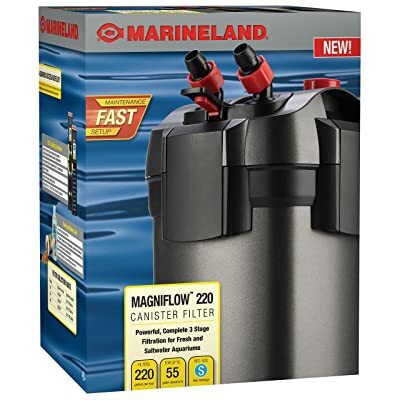 The MarineLand Magniflow Canister filter is designed to tackle this issue, as it contains a water-tight seal that eliminates the mess caused by filters. It is also not difficult to remove despite fitting tightly on the tank, and this is a plus to it. 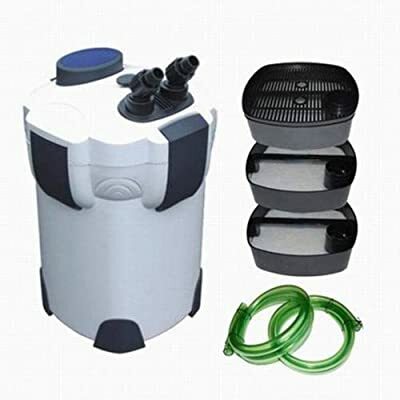 This canister filter for planted tanks is a great option if you are looking for canister filter on a budget as it is less expensive compared to other filters. It also features a 3-stage filtration process which keeps your tank clean and the filter forces water to pass through the filter trays, and not around them. Manually priming a filter can sometimes be a pain, as most aquarium buffs can tell you. This canister filter comes with a quick prime button which fills the filter chamber with water for automated priming. This canister filter also comes with a water polishing feature that will make your aquarium to look as clear as day. It has a polishing filter pad which serves as a water polisher – getting rid of fine debris that other filters can’t. If you are looking for a great canister filter brand, then you should consider this MarineLand Magnum Polishing Internal Canister Filter. This filter will keep your aquarium super clean and clear. This filter also comes with three-stage filtration processes which are mechanical, chemical, and biological filtration. The mechanical filtration traps and removes debris, the chemical filtration removes odor together with impurities in the water, and the biological filtration provides an enabling environment for the growth of Bio Spira. It also has a water polishing feature that keeps the water very clean. It also has two refillable chambers that allow you to customize filter media. The setup is also pretty quick and simple. This internal canister filter is designed for aquariums up to 97 gallons in size, and it filters at a rate of 290 gallons per hour. The motor starts easily, and it is usually very quiet during operation (almost zero noise). Another major benefit of this internal canister filter is that it prevents all types of premature clogged – keeping your aquarium always clean and providing a better environment for your fish. As a result of the submerged motor, the installation, startup, and cleaning process are quite easy, and it does not require any priming. There are lots of benefits you stand to enjoy when you opt for canister filters compared to other types of filters. This will save you a whole lot of stress from cleaning the tank more often; it will also save your fish or turtle some stress and provide it with a healthy living environment. Here are some other benefits of canister filter. Large Media Capacity: Canister filters are designed to hold filter media in larger quantities than other kinds of filters. Better Mechanical Filtration: Because they can hold larger quantities of filter media, they provide better mechanical filtration, they also have enough room for biological filtration. Higher Flow Rate: With flow rates of 100 gallons per hour and higher, canister filters for fish tanks provide faster filtration to make sure that your water is always clean and crystal clear. Quiet Operation: One of the major reasons why you cannot hear the sound of a canister filter is that they can basically be kept in cabinets. Nevertheless, the motor also plays a vital role in making the system to function as quiet as possible. Easy to Maintain, Access, and Clean: Because this system is outside of the aquarium, it is much easier to access. If you want to clean and maintain, all you have to do is to shut it down. After cleaning, you can just hook it back up. At first, canister filters were too complicated, expensive, and too large to use at home. Nevertheless, as time goes on, manufacturers have looked for better ways to improve the product, making it easy to install and setup, customizable, and affordable. Here are some things you should consider before getting a canister filter. Storage: When opting for a canister filter, make sure you have enough space to store it. Ensure your cabinet or stand has sufficient room to fit the filter. Tank Size: When choosing a canister filter, make sure you choose the one that is rated for the size of your tank. All filters contain this information on the packaging, review, or box. So make sure you look out for the rating of the filter and ensure it matches with the size of your tank before buying. If you don’t find a filter for your exact tank size, some filters have a range (for example, 60 to 90 gallons), if your tank size falls within that range, then you can go for it. The Motor: When looking for a canister filter for planted tanks, you need to put the motor into consideration. You need to go for a canister filter with an energy efficient motor. The filter will be functioning all day long, so you do not want something that will increase your bill. These raise a lot of questions, but not to worry, they are all easily answered! The best value you’re going to get is by selecting one filter that fits all of your needs seamlessly. With a canister filter, this isn’t a make or break. There are some that work exceptionally well for salt water with the right media types. But, overall the canister filter’s diversity comes out here. Many saltwater aquarium owners will use two filters. A standard power filter for running all the time and an additional canister filter that runs occasionally. Overall, it’s your choice and there are many options out there beneficial for either. Canister filters are well-known for being large. This means that you’re probably not going to get a lot of use out of having specifically a canister filter for a small tank. We recommend evaluating canister filters for tanks of at least 55 gallons or more. You can control the flow rate of canister filters if you’re worried about your tanks flow being disrupted in a smaller environment. There are options available for using a canister filter for tropical tanks, reef tanks, turtle tanks and any other type of tank you could come across. However, when you’re specifically handling turtles you’re going to be looking at filters branded for turtle tanks. This is usually where people see a canister filter and decide to go with something else instead. Canister filters range in size but most are about one foot wide, by one foot in length and one foot tall. If you don’t have a cupboard or storage space under or near your tank a canister filter can be visually unappealing. There are smaller options out there but they aren’t as powerful and they aren’t most people’s first choice. Dirty aquarium water is sucked into the filter from an intake valve or tube. The water is processed through media compartments.Most canister filters have three media compartments where you can choose what is put into place. Clean water is returned to the tank. Because the entire system is sealed, these filters have to rely on a pump. The motors are usually low in electric use and can run efficiently. Large tanks are where canister filters can really shine. They can quickly process a large volume of water quickly, and the multiple media compartments mean you can customize your filtration. People often utilize the different media compartments to deliver high-impact biological, mechanical and chemical filtration for their tank. Many aquarium enthusiasts also enjoy using a canister filter because they require a little more hands-on work. If you really enjoy working with your aquarium, a canister filter might be one of your top choices. These seem like big issues but they’re really simple. All the steps from setup to cleaning (maintaining your filter) are laid out here. Taking the time to read through can put your mind at ease in choosing the right filter for your tank! If you’re new to canister filters, we recommend taking a few approaches to reading instructions. Odds are when you get your canister filter the instructions will be incomplete and confusing. This is a common complaint! As each is a little different YouTube can be a great help to assist with having someone fill in the gaps of instructions. Most, if not all, of the items listed above, should be included in canister filter kit. If anything is missing, it’s probably the hoses which can sometimes be a good thing. Hoses that come with kits can be really stiff. Although you want thick tubing it should be easy to move. After you’ve identified all of your pieces be sure your tank is filled to the maximum water level. Then you’ll want to insert your media into each compartment or basket. What order does the filter media go in during setup? It’s recommended to have your mechanical media first so that your biological and chemical Medias aren’t worn down as quickly. This way the larger debris is caught and eliminated quickly. Afterwards, your next layer should be a biological factor. Using bio-balls, BioHome, or ceramic rings you’re maintaining as much of your chemical media as possible. Finally, you use your chemical media. Activated carbon is the most popular choice and should be placed in a filter bag. Your final steps are really dependent on your filter’s setup instructions. This is the part where your hoses or valves come into play. Some skim across the top of the aquarium’s surface while others rest under the gravel to limit water disruption. Once you have your hoses or valves setup you’re ready to power up and watch your tank become clearer! The health of your fish is definitely of highest importance! While you know you’re going to be using a canister filter, but maybe not which one yet, you’ve probably worried about the cleaning process. Canister filters, unlike power filters, are large containers made up of very small spaces that need cleaning. That’s right, don’t just shut it off. Unplug it from the power source and quickly check your seals to make sure that nothing is leaking. Flip all of your valves into the “off” position. If you forget this step you will definitely need more towels! Small leaks, especially in your valves, can best be found right before cleaning. This is part of the maintenance in ensuring the life of your filter. Pull your pipes out by twisting the lock until it is loose. You’ll see some water here but not much. Sometimes it can be a little concerning how much pressure can be needed to remove the hoses. Remember that hoses are replaceable and some valve systems are easier to use than others. Unless you’re already near a hose, bring your filter over to a sink or outside near a hose. Then unlock your canister and pull apart the housing. Pull out all of your compartments or baskets and lay them to the side for now. This is a great time to check that all of your media is handling the pressure and needs of your tank well. That’s right everything up until now has been prep. But, now that you can get into your baskets and the bottom of your filter you can use the high-pressure from your sink and a scrub pad to get the bulk of debris out. To clean the delicate parts like the impeller you’ll want to gently go over them with the bottle brush or a toothbrush. Cleaning the small part is a big preventative measure that can extend the life of your motor. Go over the smaller compartments such as the impeller hole and connector holes. A lot of gunk pools up in these areas and it’s best to clean them with a q-tip. Afterwards, clean the biological media basket. There is some fear that you’ll lose the beneficial bacteria but you can always place the media in a bucket of aquarium water as long as you discard the water after. Finally, ensure that your canister is clean by going over all parts of it first with high-pressure water and then wiping it clean with a towel. To get your filter going again it’s not quite as difficult as your first setup. You restore all of your media, place the compartments back and are sure your valves are back in their “on” position. Then get your filter going. The Fluval 06 Series external filter is the clear winner from this list. Although it comes in price heavy it meets all the requirements that an aquarium owner would have. This versatility makes it an option for any type of habitat, and the fluctuation in size make it scalable to your tank without changing models. It’s quiet and although it is bulky the solid black design means that even if it is dirty it not an eyesore. 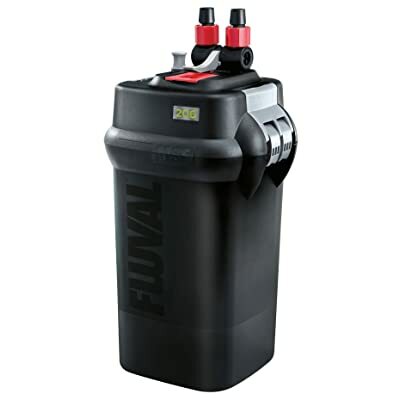 One aspect that makes the Fluval 06 Series canister filter really stand out from the competition was its ease of maintenance. The valves, and lift handles make cleaning less of a mess and handling it easier. In comparison to its competition here, the Fluval isn’t one of the smallest but it is a reasonable size of 7.6 inches long by 14.5 inches wide and 16.2 inches high. Fluval has more information on their 06 canister series here! While the Fluval 06 Series is our choice it’s always recommended to choose a filter that works best for your tank, habitat and is powerful for the size of your aquarium.